A VIN Number is a Vehicle Identification Number. 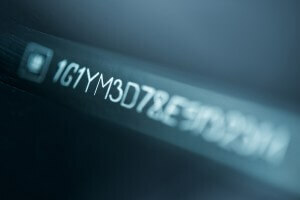 It’s an alpha-numeric code that is placed on vehicles by the manufacturer. A Vehicle Identification Number is 17 digits on all modern vehicles and describes in detail the options of a vehicle. Each of the letters and number mean something different and this VIN has dozens of vehicle details that can be gleaned from a VIN search. The VIN on a vehicle can be found in a few places. Often times it is embossed on a piece of metal that is riveted to the dashboard. It will also be on the door frame and possibly the engine block. The most noticeable location is on the dashboard on the driver’s side. You can check a VIN with our Free VIN Decoder. Click on the link and lookup any 17 digit VIN number for free. If you find that you’re having difficulty locating the VIN on your vehicle then check your registration card. Your license plate and VIN information should be listed as well as your name and address. If you don’t have your vehicle registration card then you can use our License Plate Search to lookup your VIN online. With our premium resources you can also lookup safety and recall information, license plate information as well as owner information. This is all public record and anyone can access this information online. All searches are confidential and anonymous. Start your search with the form at the top of the page.